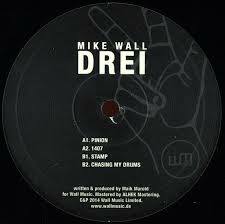 ‘Drei’ released on Wall Music Limited by Mike Wall, Berlin, previous output on Hidden Recordings, Sleaze, Suicide Circus, On and On. Technical elements comprise resonant dub chords, acerbic drones, decent cuts into solid drops. My favourite of the LP is ‘1407’ for its woozy bassline and wonky synths.